At the point I've gotten to in the Phantom Trigger alpha (looking and feeling quite polished for an alpha, BTW) it has pretty well sold me on the final product fully, and I get the sense that there's quite a bit more to see and do still. I've seen just enough of the story to be very curious about what's been happening in the real world and to then understand how the in-game action relates to it. It's an interesting and unexpected hook in a game of this general type. Though the final product may attempt to do more to explain the game systems I was obviously able to make my way through them and come out the other end at least combo capable. While you can dispatch the menagerie of odd-looking enemies with standard attacks it is the variety of elemental combos you begin to learn that are obviously meant to be where you place your focus. With some attacks that freeze and slow and others that burn for extra damage there are a number of ways to deal with your enemies and you'll need to use them effectively since even early on the game is more than happy to give you several to manage fighting at once. It feels as if, having made it through the first world, the table has been set with the basics and now I'll be able to dig into the meatier challenges the game decides to throw at me. Very early in the second world the first signs of that challenge have made themselves clear: Enemies that are in some way elemental, and can only take damage from specific types of attacks. Just to throw in a curveball some of them also rotate which element they have a weakness to. There's nothing like a game that is sure to keep you paying attention to details. Phantom Trigger was only announced for the Switch this past weekend and there's no currently-known timeline for its release. Even with the promising gameplay I've already encountered I'm intrigued by the developer description for the game including the term roguelike. As a fan of that type of game I'm eager to see how that may play into things, though at the point I'm at in the game I haven't seen any signs of it. Regardless, what I've seen is quite promising and I look forward to the final release of the game! Right from the moment you hit the title screen and the glorious retro music starts, taking me back to my classic Commodore 64 gaming days, there's no missing that this is a retro title in every way. 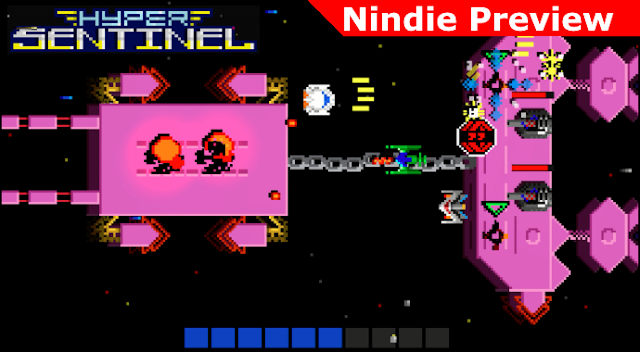 Resembling, to me, a game I might have played on my buddy's ColecoVision, Hyper Sentinel is a fast-moving homage to a variety of classic arcade-style titles. In each level you'll be challenged to destroy a number of targets on a huge ship you're flying over. You'll be distracted by enemy fighters, power-up opportunities, and a wide variety of ship defenses as you progress through the game. Each level is also capped off with a boss battle, and you'll need to work to drain the boss's health while keeping a careful eye on your own. Fortunately your ship will replenish its health if you're able to avoid being hit for a little while, though depending on what's going on at the time that can be harder to manage than you may think. While your first goal will likely be to simply survive the levels and bosses that the game throws at you the game, for most people, will really be about chasing high scores. But, in order to maximize your score you'll first have to work to keep up with everything going on! Power-ups and score multipliers will often whiz by you, making you chase them down or circle back for them. However, as the levels progress, a variety of obstacles and enemy weapon systems will make you think twice about flying recklessly. The potential for a rich classic arcade gaming experience is already in place, I'm eager to see how the final product turns out! While I’d heard of the Syberia series before I’d not indulged in any of them to this point. However, since it has been confirmed that Syberia 3 will be coming to the Switch I decided to check it out. Having played quite a number of adventure-style games that Syberia 3 is reminiscent of, after a few hours of play, I’d say it represents its genre pretty well. It tells a reasonably good story and has you solving puzzles through a combination of smarts, found objects, and some good old experimentation. Starting with the positive I’m reasonably intrigued by the game’s story and main characters. While there are elements to the story that are familiar the foreign setting and culture of the nomadic group that found and saved you are interesting and I’m curious to see how it will all play out. The puzzles to this point are also generally a positive as they do a good job of making you intuit your solutions through targeted trial and error, making you feel smart when you figure them out. A few times there have been clues there to help guide me, but the nice thing is that I typically didn’t completely understand them until I was well on my way to finding the solution, which is a nice balance. Where I’ll throw a bit of caution out is definitely on the fact that this is a pretty classic slow-paced adventure title and there’s nothing here that breaks away from that mold so if you’re not into that sort of game you’ll want to steer clear. At least to the point I’ve gotten in the game a criticism is that even moreso than normal the experience is a bit “on rails” at times, turning it into a sort of mildly interactive story since there are limited things to interact with along the way. However, since some games in the genre have also infuriated me with a pile of garbage to wade through in order to find what you need to progress I’ll credit it with not needlessly wasting my time either. It’s a difficult balance. 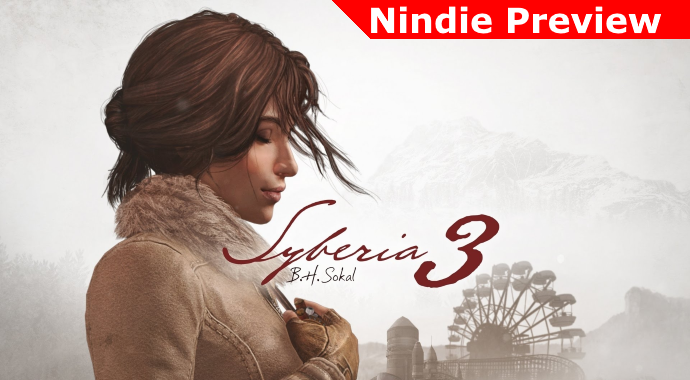 At the end of the day Syberia 3 will be a completely unique experience at this time on the Switch, and people looking for a story-driven adventure should probably be satisfied with it, depending on pricing and other details. I played the game on the PC using an XBox 360 controller and it worked well, so control moving over to the Switch shouldn’t be an issue. The characters and environments are sufficiently large on-screen that it being playable while in handheld mode should also not be a concern. It’s a game to look out for if you’ve been itching for something story-driven with some puzzles along the way. The goal of this exercise is to shed light on independent games out there that I've had a great time playing and that would seem to be well-suited to playing portably on the Nintendo Switch. Nothing is listed here because of any special insights and there's no "wink wink" to any of it. 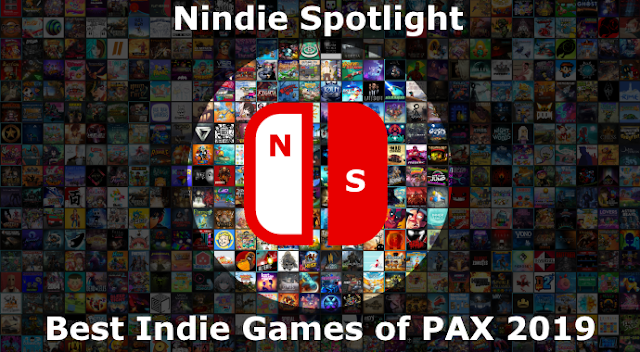 It is purely a listing of indie games I enjoy, that perhaps you should check out if you'd like where they're available currently, and that would be awesome on the Switch. OK, so the pitch sounds absolutely ridiculous to anyone who isn’t familiar with the game. For the uninformed you just need to imagine 3-on-3 soccer played with rocket-powered cars. Completely crazy, yes, but in execution it is a game that is slowly inching towards my all-time most played game second only to the hat simulator also known as Team Fortress 2. Rocket League is a legitimate eSport, it is fast, it is fun, and it is the only “sports” game I’ve ever stuck with for any significant amount of time. Even now, though the game has been out for quite some time, there are still new modes and enhancements being made to the game on a regular basis. Nintendo, please make this happen! This one just came out and I’ve only just begun to play it but it is a roguelike with style and fun to burn, the only pain is it would be even better in portable form. You’re roughly a bounty hunter using your grappling hook, your gun, and some skilled execution to bring down your targets. A really good time, it is the newest big indie roguelike darling for a reason. OK, so this one is getting pretty old, and I’m also aware the toolset it was made in isn’t currently supported by the Switch. But when the details on the system were announced this was the first game I really got into wanting to see in a portable form! Another rogue-like the itch for this will be scratched somewhat when Enter the Gungeon hits but, overall, I still prefer Nuclear Throne and the characters you get to choose from. Their play styles can be quite radically different and it is a whole lot of aggravating fun! While I'd seen it available in the nVidia store for the Shield TV and had also heard some positive buzz it wasn't until I took it for a spin that I began to understand why people like it. I suppose it has just been such a long time since I've played a fun arcade-style baseball title that I'd practically forgotten they could be made. Stylistically distinct it can look a bit goofy but make no mistake, there's both accessibility and depth to be had in this game, a combination that can sometimes be tough to put together in balance. Until Nintendo would decide to make their own baseball title this may be the most ideal option in the current market for making a splash on the Switch. What an odd but engaging title this one is. Imagine a speed-runner mixed heavily with platforming elements, but that your platforms are actual tractor trailers crashing into things and each other. As it progresses there get to be even more diabolical puzzle elements that will force you to use your brains as well as your reflexes to control your flying through the air and hopefully not crash and burn. The quick round nature of the game would be especially well-suited on the Switch. While I may have been a little late to the rogue-like party in the PC gaming space once I finally got a taste of it, thanks to incredible indie titles like Rogue Legacy, Nuclear Throne, and of course The Binding Of Isaac, I found I couldn't get enough! Perhaps it is the old-school arcade gamer in me but I both thoroughly enjoy and even cherish the "put your quarter in, do your best, lose, and try again" experience. There are certainly modern games in that vein that aren't rogue-likes, my favorite probably being Geometry Wars, but where games like that merely replicate the old arcade experience I think that rogue-likes pretty well perfect it. Before we delve into what the essential elements of the spirit of something being a rogue-like are, we should clarify something they most definitely aren't. Where people mostly like to think about games in terms of genre, here we're dealing more with a game "type" that could blend with pretty well any genre. Let's call it a catalyst for challenge and fun, transforming what could be somewhat ordinary into something more. Moving past that distinction we'll get to the core of what distinguishes a rogue-like from games that are just hard and "make you start over". First, it is a given that the general layout of your game space will be different in some way every time you play. There can't be a static level design, you can't be allowed to get into comfortable assumed patterns (at least not too much), and where you'll find enemies and/or power-ups is going to be a toss-up. Looking at the 3 on the Switch you have Isaac and Has-Been Heroes with their random map layouts and Tumbleseed where the way the levels are composed is completely different every time. The emphasis here is on forcing people to be a bit off-balance by things every time, to only have a general idea of what they'll face but not a great one, and to keep them on their toes. Second, on top of the level designs being varied and unpredictable what you'll be given to work with on any given run will also get changed up. Rogue-likes have a tendency to sport a wide variety of potential powers and when you go through them you'll be asked to make lemonade out of whatever ingredients you've been given. Sometimes you'll get things that work well together and suit your style, other times you'll simply know that the RNG (Random Number Generator) gods simply hate you and want to you die like the pathetic loser you are. Most of the time you'll thankfully end up somewhere in the middle, but you will have your peaks and valleys. Such is the way of the rogue-like and all 3 titles on the platform fill this line item handily. The third thing that rogue-likes employ in some way is a very strong (sometimes more than people can take) sense of trying to balance risk versus reward. You will be tempted and whenever your run ends you will inevitably debate what would or could have happened if you'd only make a different decision when X happened. Should you lose the heart (or 2 or 3) and take the deal with the devil in Isaac? When you get to one of the handful of shrine types in Has-Been Heroes will you get something good or bad? Will you at least get something good enough to offset the bad that will likely come with it or should you just pass? In Tumbleseed, even though you know the Bouncy Friend is an unpredictable ball of pain that will somehow manage to run into you at the worst possible moment almost every single game will you hold out faith that the few enemies it will take out make it worth the trouble? These are decisions you'll make every game and likely many times in every game in rogue-likes and that's part of the reason they're often perceived as being "too hard" because making the wrong decisions in these moments can sometimes cripple your entire run. If you enjoy them you've merely accepted that the RNG gods are fickle and move on, weathering the storm and perhaps deciding to then double down with your next decision in the hopes it will turn around... though often it only gets worse. Now that we're through defining what a rogue-like is and should always be I suppose all that's left is covering why I find them so appealing, especially on the Switch. A big piece of the puzzle is absolutely that the portable capabilities of the Switch lend themselves very well to the shorter-form play times that rogue-likes often have. Even if the run itself could be a bit lengthy they tend to be broken into chunks, typically lasting just a few minutes with an opportunity for a break in between, making for a convenient place to pause and come back to later. This quality also makes them well-suited to people who are pretty distracted and want to play something that isn't taxing them with story or complications. Get in, get a challenge, move on a bit refreshed... it can be satisfying if you don't get hung up on the fact you usually have failed to win in some way. Another way that rogue-likes really appeal to me is that with their difficulty I find their sometimes infrequent rewards to be far more meaningful. If you're able to clear a run and be even somewhat successful, despite all of of the obstacles that have been thrown in your way, it is far more exhilarating to me because I've really had to earn it. That's not to say that games you've invested time in and complete can't be similarly rewarding but I've also completed my fair share of titles where the end was a bit ho-hum because the journey hadn't made me invest much to get there. I can't think of any rogue-like I've beaten where I wasn't on pins and needles the whole time. Even among the games I've never finished or rarely finish that tension as you inch closer and closer builds and, for me, even losing there is a thrill I don't often get in other "normal" games. At the end of the day, I suppose, you're inevitably going to either "get" rogue-likes and love them or they'll likely be seen as nothing but horrible aggravation factories put on this planet to punish you. They're a type of game that is, no doubt, a lot more stick than carrot but when you're wired to rise to challenges put in front of you rather than shy away they can be very appealing. That said, as much as I enjoy rogue-like not all of them appeal to me. Spelunky, as much as it is revered, for whatever reason didn't click for me, so even if you have tried one or two games in this vein that doesn't mean that none of them will appeal to you. I'm just hoping by putting this together I've helped to inform a few folks and to convince them that perhaps rogue-likes are worth giving a try. A little bit (well, or sometimes a hell of a lot) of challenge can do you some good! Tumbleseed's core gameplay should be somewhat familiar to people who've spent some time playing a classic physical game like Labyrinth. The idea of balancing or controlling a ball along a path to avoid holes is a simple one, it's in the execution that the challenge arises. What looks easy and is conceptually straight-forward isn't always quite that way when gravity, your reflexes, and your patience get pulled into the picture. For me, perhaps it is this belief that beating a game like Labyrinth should absolutely be something I can do that typically makes me return to it over and over no matter how many times I may lose at it. While Tumbleseed adds a wide variety of elements that ramp up complexity, at its core its principles are very similar, as is the addictive "I can do it if I just try one more time" mentality when it continues to get the best of you. The point of the game isn't a grand narrative with insights into the human psyche or somehow a re-telling of the classic hero's journey. You're a seed, you want to get to the top of the mountain, the game will throw a wide variety of challenges and decisions at you that you'll often get the short end of the stick on, and you'll die a whole lot. If you're a fan of old-school arcade challenges where your only reward is the accomplishment and hopefully a decent placement on the online leaderboards I'll enthusiastically say that Tumbleseed is likely a great match for you! If you want a deep story and meaning, or even a solid chance you may ever finish the game you may want to pass. If you've heard about these "rogue-likes" and are willing to front the very reasonable price of entry this is a pretty mainstream-friendly, though quirky, representation of that game style, though very distinct from any one that I've ever played. Getting down to the basics the premise of the game is that you'll start each adventure with the capability to shift between 4 basic types of seeds: one for setting checkpoints, one for adding thorns for basic offensive capabilities, one for generating crystals you'll use as currency, and one for healing yourself. Your goal is to move through a variety of distinct zones, with all sorts of challenges and surprises at every turn, and get to the summit to fulfill your seedly purpose. Along the way you'll have standard rogue-like decisions to make: Which random power-up will you choose? Will you indulge in a challenge that could help you if you succeed but will hurt you if you fail? Are you willing to trade in 2 seed types you're unlikely to use in the hopes the one seed you get in return will be helpful? If the RNG (random number generator) gods are showing you favor perhaps you'll temporarily get a perfect combination of things going your way, but often those gods are fickle and your plans will quickly collapse with the wrong combination of enemies, a stumble or two in your execution, or often a lack of full understanding of how things that you thought were there to help you can also be lethal under certain circumstances. Every time you start it's a crapshoot, and this is where the game will either appeal to you or where it will fall apart, the same as it is for any rogue-like. Depending on how far you progress in a given run you'll begin to be given random choices of additional seed types to help you along the way. In general they'd fall under the categories of offensive, defensive, and "helpers" of various kinds. In general your offensive choices have their appeal, as you go along there are a variety of enemies who'll try to get you and it would be nice to both kill them to no longer be pressured by them (often leading to a fall down a hole) or to reap the benefit of crystals they leave behind when they die. The downside to using the offensive powers is that most of them will also harm you if you're not careful or if you don't get pretty far away. Your defensive choices include cloaking and some shield types but what you'll find is that their usefulness tends to be very specific. For example, a shield that will temporarily protect you from something shooting at you won't help against a pouncing spider. Add on the fact that defensive seeds tend to carry a pretty high resource cost and while they're an option, you need to consider them carefully. In the last category there are various type including seeds that will help you by springing you into the air (for a relatively short distance unfortunately), slow down time, or fill in (some) holes with water but again these powers have their limits, in this case mostly tied to proximity to a planting spot. Just to really make things crazy there's even a seed that is completely random, the great benefit of it, though, is that it is free to use, and it is quite possible to get a solid run going with it even if it is a bit crazy. As you get a little further into the run you'll also be able to make use of a single aura chosen by the game at random. These also carry a risk/reward to their use. You have a bouncing buddy ball that will kill enemies... but look out, he'll hurt you too! There's a ghost variant that does the same except it will slowly chase you instead of bouncing around randomly. If you don't stop it can be useful, but considering this is a game where you sometimes need to wait on things it can be absolutely more lethal to you than your enemies. There are also power-ups like one that will increase the size of any projectiles you fire, but unfortunately you'll need to keep in mind this property also does the same with enemy projectiles. The message here is that there is no magic combination of seeds and abilities, the more effective types tend to either have a high cost or risk, and from run to run you'll need to be able to take a set of options in front of you and make the most of it. The Switch has been blessed very early on with what is now beginning to take shape as a diverse collection of rogue-likes. 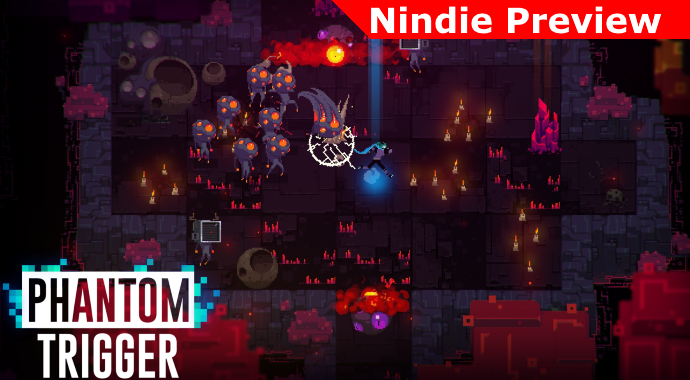 While it opened with the well-known Isaac, bringing the rogue shooter to the table, it then veered off into the strategic lane-based challenge of Has-Been Heroes. Tumbleseed goes completely off the board and brings its own unique vision to what a rogue-like can be with an adventure game of sorts, though in general the game feels very much like its own thing and is difficult to put in any known box. I was enthusiastic about the possibilities it could have from the moment it was first shown and having sunk many hours into the game now I have to say I'm thoroughly impressed with the result and, especially at its very reasonable price point, would recommend it to anyone who enjoys a challenge for their mind and reflexes.